From 24-30 September 2018, eight YST students embarked on a journey of musical sharing across Bandar Seri Begawan, Brunei and Miri, Malaysia. Initiated by Year 3 Trumpet student Lau Hui Ping, the project sought to engage students with professional music instruction, contribute to teaching practices in the community, and hone pedagogical skills for YST students. The team comprised BMus students Alice Cahya Putri (Year 3, Voice), Chen I-Hsuan (Year 3, Horn), Chiang Yung-Yuan (Year 3, Clarinet), Hoong Miane Sng (Year 4, Tuba), Ilysia Tan Jiayng (Year 2, Composition), Natalie Koh (Year 3, Violin), and Teo Shao Ming (Year 4, Flute), in addition to Hui Ping. Over the course of the seven days, the team organised a suite of activities across both locations. 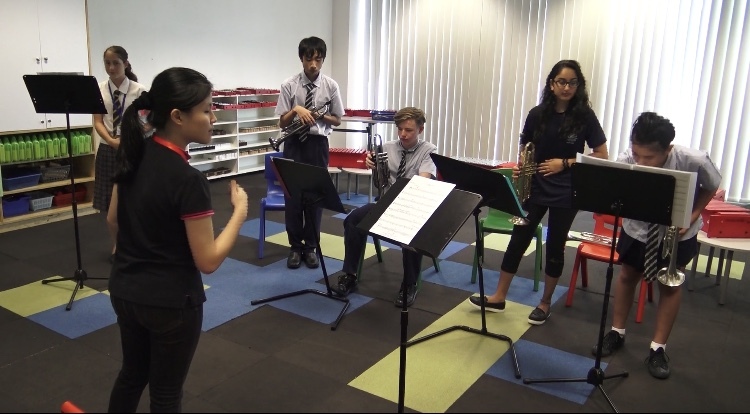 For the first three days in Brunei, they held masterclasses and chamber coaching sessions, as well as performing a small recital at the Expression Music Academy. Hui Ping conducting a trumpet sectional. With staff and students from International School Brunei and Jerudong International School. The subsequent four days took place in Miri, where the focal point was the band programme which saw three different secondary school bands come together for sectionals and individual lessons, aural and theory training, as well as combined band practice. Separately, the team also provided individual strings and composition lessons to help local music teachers improve their own pedagogical and music-making abilities, held coachings for three local choirs, and delivered an interactive presentation on their musical instruments at SJK Chung San Riam Miri primary school (Hui Ping’s alma mater). Shao Ming coaches students on flute technique. Miane Sng demonstrating breath technique. Alice conducting a choir rehearsal. The entire trip culminated in a final performance at the Gymkhana Club Miri, where the team presented an hour’s worth of chamber music for an audience of over 200 people, ending off with an arrangement of a Malaysian song Sejahtera Malaysia jointly performed with a choir comprising members from the participating Miri secondary schools. It was a warm celebration of the relationships forged on the journey. The YST team and choir members from Miri at the final recital. Perhaps, though, the journey is not quite over. Hui Ping notes that one of the school band teachers shared his plans to organise a concert this year, bringing together all school bands in Miri and possibly from other regions in Malaysia and beyond. Continuing in the vein of this trip, he has expressed his wish to invite the YST team to hold workshops ahead of the concert. We certainly hope the inspiration and learning that the team has sparked continues!